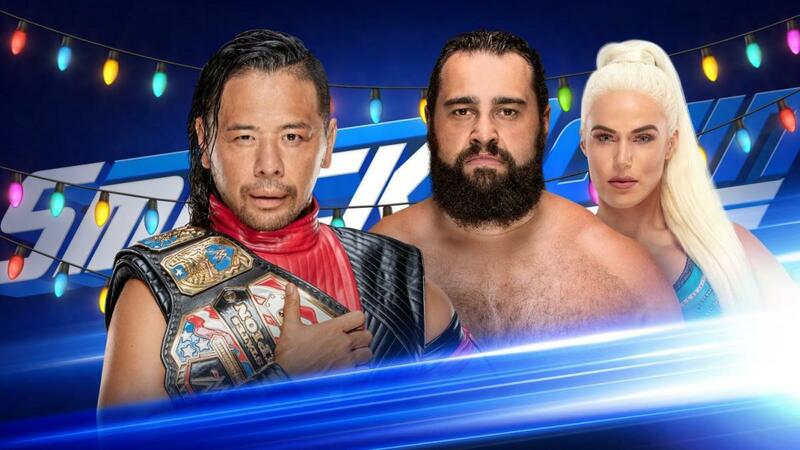 After being taped in Fresno last week, the Christmas Day edition of SmackDown will air tonight. United States Champion Shinsuke Nakamura defends against Rusev. A few weeks ago, Rusev pinned Nakamura in a tag match to earn this title shot. Last week, Nakamura showed embarrassing clips of Rusev from Total Divas to prove he doesn’t need to be afraid of him. Rusev promises to win the championship on the greatest day of the year -- Rusev Day. Shane McMahon will appear on a special Christmas edition of Miz TV. Miz has tried to convince McMahon to form a tag team. He even asked for Vince McMahon’s blessings last week but didn’t get it. Jeff Hardy goes one-on-one with Samoa Joe. Joe has been taunting Hardy about his personal struggles. He even held a public service announcement a few weeks ago. Tonight, Hardy looks to gain some revenge. SAnitY attacked Luke Gallows & Karl Anderson and The Usos as SmackDown Tag Team Champions The Bar watched on last week. The tag champs then attacked the already beaten babyfaces. Tonight, SAnitY continues on their path of rampage. Our coverage begins at 8 p.m. Eastern time. R-Truth and Carmella came out to start SmackDown. Truth was dressed as Santa Claus and Carmella as an Elf. The entrance is decorated with Christmas Trees and presents. There are also Christmas trees and presents around ringside. Truth welcomed everyone to a special Christmas edition of SmackDown. Truth started naming the reindeer but then started naming members of the Jackson Family. Truth and Carmella broke into a carol break. WWE Champion Daniel Bryan came out and was upset that he’s here and not with his family. He revealed that this isn’t the real Santa Claus. He started yelling “Fickle” at Truth and Carmella. He’s here to expose the real Santa Claus. He noted the people’s obsession with materialistic products damaged the environment. He said in 20 years there would be no North Pole and no Santa Claus. Truth called Bryan an angry little elf. Bryan called Truth’s career a joke. Truth said it might be but he’s going to be number 30 in the Royal Rumble. He noted he might be the one to beat Bryan for the belt if he’s still champion at WrestleMania. Bryan asked how Truth could win the Rumble if he’s can’t count to 30. Truth started counting to prove he can. He got to 7 and they broke into a dance break. Bryan jumped Truth and attacked his leg. He rammed Truth’s leg against the ring post. Bryan then locked on the heel hook and continued the beat down. Almas jumped Ali with a drop kick to start to match. Almas had the early advantage until he missed a charge in the corner. Ali fought back and caught Almas with a hurricanrana. Almas shoved Ali off the second turnbuckle to the floor to take over. During the commercial break, Almas was firmly in control and scored a near fall. They traded chops in the center of the ring. Ali hit the rolling DDT for a near fall. He missed a super kick and Almas took over with a back elbow. Almas caught Ali in the tree of woe and hit a double foot stomp off the top for a near fall. Ali and Almas fought on the top turnbuckle. Ali attempted a sunset flip powerbomb but Almas landed on his feet. Almas missed the double knees in the corner and Ali hit a tornado DDT. He then hit the 054 for the win. In the locker room, Samoa Joe discussed his upcoming match with Jeff Hardy. He continued to taunt Hardy. Joe believes he’s Hardy’s new addiction. He promised that everything around Hardy will fade away. The New Day joined on commentary for the match. They had their own Christmas themed announce table. The babyfaces were in control early. The heels took over when Eric Young distracted Jimmy and Killen Dain nailed him with a cross body. The heels isolated Jimmy on their side of the ring. Gallows got the hot tag and ran wild. The Usos took out SAnitY with super kicks. Finish came when Gallows and Anderson hit the Magic Killer on Cesaro for the win. A video aired for the upcoming debuts of some new faces. This included Lars Sullivan, Lacey Evans, Heavy Machinery, Nikki Cross and EC3. Backstage, Mustafa Ali was walking in the back. Brian Kendrick, Akira Tozawa and Cedric Alexander congratulated him. Shelton Benjamin officially welcomed Ali to SmackDown. Daniel Bryan then jumped Ali from behind. He kept yelling that Ali doesn’t deserve to be on SmackDown as he beat him down. The Miz hosted Miz TV with guest Shane McMahon. The Best In The World Trophy was in the middle of the ring with a Santa hat. He asked if McMahon saw his match last week. McMahon didn’t want to talk about that. Miz asked about the new changes. McMahon noted his family is running both shows now. He said they’re listening to the fans and they’ll decide the narrative. Miz noted that since there are four people running SmackDown now then McMahon should be his tag team partner. McMahon’s not out here to talk about that. Miz pointed out that he and Mandy Rose defeated Truth and Carmella last week. Miz revealed why he wants to be McMahon’s partner. He said this isn’t about him but his dad. Miz ran down his accomplishments but he never heard his dad say he was proud of him. Miz said his father was impressed with McMahon in the Best in the World tournament. Miz wants to be McMahon’s partner for his father. Miz said the fans should make the decision if they should be partners. Miz asked the fans and they broke into a “Yes” chant. McMahon noted Miz’s story resonated with him. McMahon finally agreed to be Miz’s partner. Miz did the Yes chant. They held up the trophy and hugged. In the back, Rusev noted today his birthday. He promised to win the belt tonight. He said it’s not going to just be the greatest birthday or Christmas day. It’s going to be the greatest Rusev Day. Joe had early advantage and worked over Hardy. Hardy fought back and scored a two count. Joe slowed the pace down and locked on an abdominal stretch. Hardy fought back and hit a drop kick for a two count. Hardy hit the whisper in the wind for a near fall but Joe grabbed the bottom rope. Hardy hit the twist of fate and went up for the Swanton Bomb. Joe rolled out of the ring to the floor. Hardy caught Joe with a clothesline off the apron. Hardy attacked Joe with knees on the floor. He wouldn’t stop so the referee stopped the match. Hardy threw Joe over the announce table. Joe fought back and choked out Hardy with the Coquina Clutch. In the back, Shinsuke Nakamura said Rusev’s been naughty this year. The only thing he’s going to get is a knee to the face. The Usos were walking backstage discussing their win. Jimmy went looking for Naomi. Instead he found Mandy Rose and Sonya Deville. Rose pointed out he was standing under mistletoe. Rose flirted with Jimmy when Naomi ran in. The heels ran off and Jimmy held Naomi back. Jimmy and Naomi ended up kissing under the mistletoe. Rusev was in control early and went for a slam. Nakamura countered into an armbar but Rusev slipped out. Back from commercial, Nakamura was firmly in control. Nakamura missed a knee and Rusev took over. Rusev hit a back suplex for a near fall. Nakamura regained control with a kick to the back of the head. He followed up with a running knee for a near fall. Rusev tried to suplex Nakamura to the floor. Nakamura fought out and drop kicked Rusev to the floor instead. Nakamura rocked Rusev with a series of knees. He slowed the pace down with a front face lock. Rusev fought out and tossed Nakamura across the ring. Nakamura fired back with stiff kicks. Rusev fired up and made a comeback. He hit a fall away slam, splash in the corner and spinning heel kick for a near fall. He rocked Nakamura with a kick to the side of the head for a two count. Nakamura regained control on the floor. He sent Rusev into the steps and announce table. Nakamura set up for the Kinshasa but Rusev hit the Machka kick for a very close near fall. Rusev went for the Accolade but Nakamura reversed into the triangle submission. Rusev powered out and slammed Nakamura down. Nakamura regained control and set up for the Kinshasa. Rusev missed the Machka kick. He rocked Nakamura with a clothesline and then hit the Machka kick to win the United States Championship. Backstage, AJ Styles entered Vince McMahon’s office. McMahon asked him what his name is and who is he. Styles noted he’s a former two-time WWE Champion and SmackDown is the House AJ Styles built. McMahon wondered why he’s walking in the back while Daniel Bryan is raising hell. McMahon noted some stars make their money and go home. He knows Styles isn’t like that. He’s more like McMahon. He noted Styles has a tortured soul. There’s an animal inside of Styles begging to come out. McMahon wants to see that animal and he slapped Styles. Styles snapped and he attacked McMahon. He hit him and knocked him to the ground. Referees and officials came in and pulled Styles out. The referee checked on McMahon. He said he’s good as he lay on the floor. Next Week: John Cena returns on the New Years Day SmackDown. Plus, The New Day hosts a special New Day New Year’s Celebration.